Of course, you know all about the big fashion icon on the east coast, New York City, but what about the one on the west coast, Los Angeles? L.A is a literal breeding ground for future fashion favorites, both designer and pop-up store wise, so if you are a fashion guru and you haven’t visited yet you are truly missing out! ARGYLEHaus of Apparel - What better place to start your 4-Day Fashion Tour of L.A than at one of the most respected designs and apparel studios, ARGYLEHaus. This popular company provides ‘high-performance value in fashion from concept to consumers’, a skill in high demand currently across our fashionista nation (and the world). Explore the design house and apparel manufacturing company and learn about their entire repertoire of services, from apparel pre-production to manufacturing. It’s easy to see why this is your introduction to the L.A fashion world! Fashion District - Next stop, the iconic, and astoundingly massive, L.A Fashion District. This spot is the hub of the L.A fashion industry, 100 blocks (1000 stores) of stores that you aren’t going to want to miss. Shop, sightsee, eat, and visit wholesale showrooms while here or even head to the LA Flower District on 8th Street. The cut, silk, and potted flowers here make up the largest flower market in the U.S, not to mention the largest selection of textiles and notions in the nation throughout the wholesale market. Santee Alley makes a great open-air festival like shopping area, but overall about 80% of the district is showrooms full of retailers, designers, buyers, and wholesalers. Stop by any of the 218 eateries on site once you work up an appetite, which you will. (We suggest Yellowfin Fish Grill). Dakota Showroom - This showroom will give your group great insight into what it takes to care for a fashion brand, from the very beginning to the very end. Think of this as a fashion daycare only more adult, a spot in which ‘emerging brands can be professionally nurtured and retailers can be cared for’. There are 10 different designers represented here including Beach Bell, Lisa Marie, and Goldie London. There are also several events tradeshows throughout the year, this year (2017) the city of L.A hosting 6 different ones including the Majors Market. This company also has showrooms in Dallas, and each location typically provides excellent showroom touring opportunities with appointed guides. Junkyard Showroom - Welcome to the Junkyard Showroom, a place where oddly enough, you will find the exact opposite of its namesake. At this location, you will find a multi-collection accessories showroom which serves as the ‘focal point of exploration for retailers and designers alike’. Unbeatable distribution, marketing, design feedback, brand identity, and positioning is what wholesalers and retailers will get from this company, not to mention the worldwide influence and top store connection internationally. Find excellent wholesale opportunities, showroom viewings, and regular fashion events at this fun fashion-filled stop! Nasty Gal - You’ve had a busy day, fashionistas, but the last stop won’t want to be skipped, we promise! Nasty Gal is a place for ‘gals who’ve got the confidence to just be themselves’, a highly popular brand rooted in L.A but available online anywhere. Starting just 10 years ago with a laptop, vintage clothes, and an eBay account, owner and creator Sophia Amoruso today owns an internationally recognized clothing, shoe, and accessory line. The studio itself is artsy and open, with brick and marble outlining the showroom and onsite cafe (Hub), and the clothing is edgy and empowering. Your welcome, Nasty Gals! Place Showroom - This is the Place to be (pun intended) to learn about excellent emerging brands, a great touring opportunity for your fashion-forward student group to see the beginning stages of fashion fandom. Place Showroom is an L.A staple wholesaler, a Leah Justman brainchild that provides a professionally nurtured brand atmosphere, with such successful brands as Lovers + Friends, JOA, and Keepsake emerging from the companies care. As Justman says, “Our business has always been to make your business a success’. A frontrunner in the fashion industry and highly requested client-centric service, Place Showroom will really give your group valuable insight into L.A’s fashion world. Artists & Fleas: DTLA - Welcome to L.A’s version of the Chelsea Market, an iconic extension of the Artists & Flea brand (the backbone of Chelsea Market) that allows your group a chance to see a ‘unique, curated market approach’ to the city and fashion within. There are two different markets in L.A, one in the DTLA district and one in Venice. You will be able to catch one or another each Saturday, DTLA hosting the 1st and 3rd Saturday of the month, Venice the 2nd and 4th. See arts, crafts, showrooms, fairs, and flea markets throughout, Artists & Fleas doing a great job at continuing to build a cooperative community and gathering place for artists and designers. There are several different restaurants and coffee shops throughout this urban chic series of neighborhoods, so be sure to stop for lunch here! Fashion Institute of Design and Merchandising - Talk about an amazing fashion opportunity! The iconic Fashion Institute of Design and Merchandising is one of the top spots your group can go to learn all they need to about fashion education and early establishment in the market. This college provides courses in interior and graphic design, fashion, entertainment, and beauty, a Grand Avenue L.A gem with over 26 accredited programs. The school has a 51% acceptance rate, a competitive college for those students interested in furthering their passion for fashion. Take a campus tour, sit in on a class, or just explore the halls of the institute, each option providing excellent educational opportunities for the group. Keith and Margo’s Murder Mystery Dinner (7-10 pm) - You’re in for a special treat, or maybe trick, for tonight's dinner, a nationally recognized Murder Mystery Dinner. Keith and Margo’s Murder Mystery Dinner will put your group in the hot seat as you try to figure out ‘who done it’ in a classic clue-like murder scene. All the guests in the crowd get to participate in the investigation, be interviewed as a possible killer, and even get the chance to BE the killer. This mystery isn’t only entertaining, it’s delicious, the local restaurant Matteo’s serving up a gourmet 3-course meal with such Italian classics as Chicken Parmigiana. (Vegetarian options, appetizers, dessert, and cash bar available also). New Mart - It’s day 3 of your big fashion journey and you are truly going to start it out right at one of the original L.A landmark fashion institutions, New Mart. New Mart, on 9th Street, sits as a leader in style, art, and fashion for decades, the impressive 12 story, 160-foot high building first built in 1926 under the famous architectural guidance of Curlett and Beelman. Here you get retail stores, offices, and manufacturers, with over 100 wholesale showrooms and 1000 unique apparel lines within. This world-renowned center will get your students excited about fashion, presenting to you the most popular apparel and accessory lines in America today! Fashion Business Inc. - Welcome to FBI, an internationally recognized brand ‘where creativity meets education’. This spot holds various fashion platforms, has a major global reach and matches consultants with experts in the industry daily. Fashion Business Inc is the leading resources for ‘turning concepts and fund businesses into profitable reality’, giving their clients the tools they need to succeed such as world-class industry education, technical training, sourcing, networking, and so much more. There are several unique educational opportunities here and they have only been getting better since FBI opened in 199 here in California’s Market Center. Over 5500 existing and emerging fashion entrepreneurs have emerged here, who's to say you won’t be the next? Downtime - Your group may wish to relax this evening back at the hotel after you grab a bite to eat for dinner (we suggest Tokyo Town), sightsee around the streets, or even continue your fashion-forward journey at any nearby shopping malls. Downtown’s Santee Alley - More shopping? You’d better believe it! 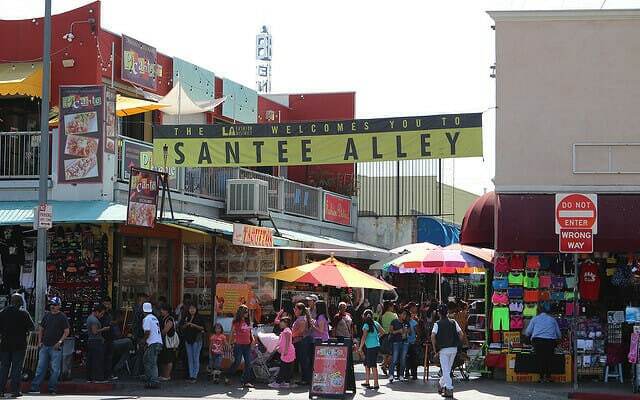 Santee Alley, LA’s premium Fashion District shopping experience – renowned for its festival atmosphere - features more than 150 merchants offering unbelievable bargains on countless “hot” items. This is the place to go to track down the best buys on the latest trends in clothing, shoes, jewelry and accessories, fragrances, cosmetics and more! "The Alley" – which really IS an alley - is open 365 days a year. Hollywood and Highland - Hollywood & Highland is the premier entertainment and event location on the West Coast, having hosted everything from the Academy Awards to the Victoria Secrets Fashion Show. A shopping, dining, and entertainment complex located in the heart of Los Angeles, Hollywood & Highland is the perfect destination for your group to enjoy before you head back home.The complex, among other things, is a fully functioning mall with boutiques, popular chain stores, specialty stores, and high-end apparel. Check out American Eagle, Gap, or Hot Topic then slip into Louis Vuitton, Fossil, and more. Find everything you could want to buy from costume jewelry to designer accessories at Boutique Italia, Christmas products to designer luggage, all in one convenient location. 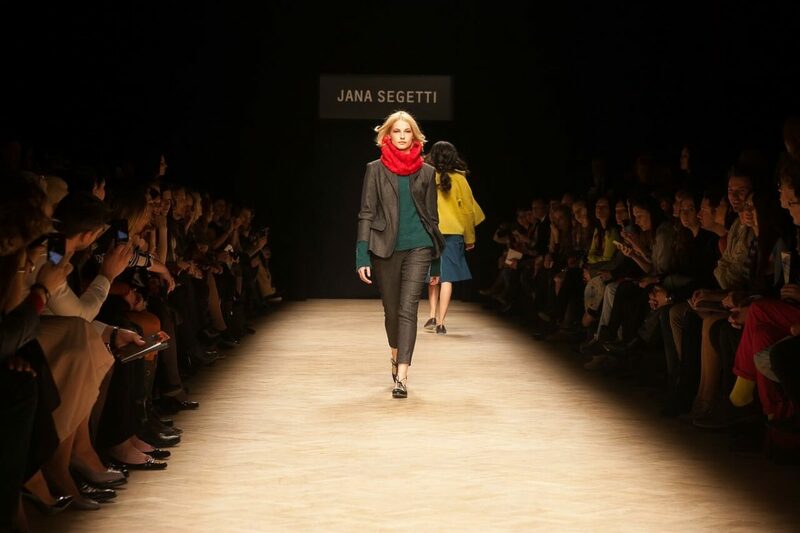 Want more great fashion tours to explore from AST? Check out our Fashion Tours Theme Page!